We made Rick Stein’s picada dish last week because I was desperate for mussels. 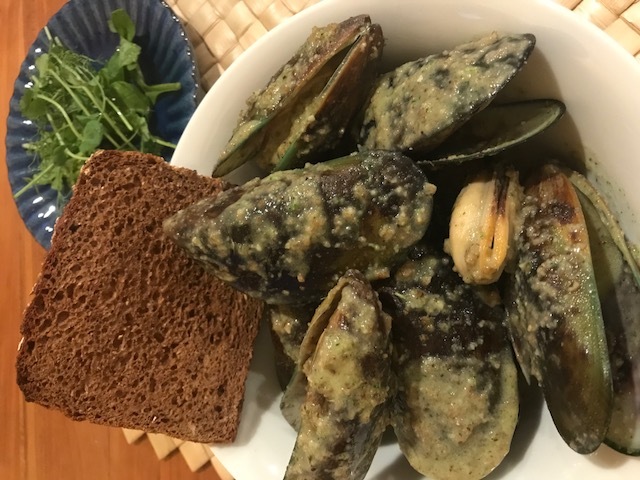 The recipe comes from his ‘Spain’ book and refers to clams but I chose mussels instead. Pipis or any other shell fish would work equally as well. Dry roast the almonds and pine nuts in a frying pan or a tray in the oven until they have a nice golden colour. Leave to cool. Fry the slices of bread in 2 Tbsp of olive oil until crisp and brown on each side. Leave to cool. In a food processor place the bread, torn into smaller pieces and also add the nuts. Wizz until it is the texture of course sand. Add the garlic and parsley and the remaining olive oil and grind until it makes a thick paste. Clean the mussels under cold running water and pull out any beards. Heat a large pot on high until very hot and add the mussels and 4 Tbsp of water. Cook with the lid on until the mussels have just opened. Take the pot off the heat and drain some of the liquid into a bowl with the picada mixture. Give it a stir to loosen it, then add back to the pot with the mussels. With the lid on give it all a good shake to ensure the mussels get completely coated in the sauce. Serve immediately in bowls with a slice of fresh bread on the side to soak up the juices. It would also be delicious with some cooked spaghetti tossed through at the last minute.